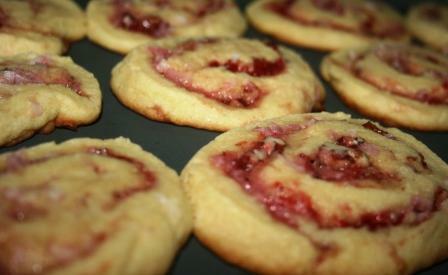 So I'm finding ways to use up the strawberry jam we made and these cookies are - quite simply - amazing! And don't they just look beautiful? The recipe is adapted from a church cookbook that my mother-in-law gave me, and the recipe author listed in the book is Sue Bulling (if you're out there somewhere reading, Hi Sue!). Stir together flour, baking powder, and salt. In a separate bowl, beat together softened margarine, sugar, eggs and vanilla. Add to flour mixture. Roll out and cover with jam, coconut, and nuts. Roll up dough in waxed paper and chill. After chilled, slice about 1/4 inch thick and bake at 350* for 10 minutes (it took mine a few extra minutes, but I sliced them a little thick). This is a wonderful way to use your jelly. They look terrific! Those are gorgeous and look delish - another good idea for teacher gifts! Oh, yum! That is a great way to use your jam!! Oh, boy! These do look delicious! I want to try them...thanks for the recipe! I want one right now!! Those do look might good! I love any church cookbook cookie recipe and these look and sound awesome! These look delicious! But I have a terrible cookie sweet spot. I have never made these! They look fantabulous!